The Working Memory Classroom Strategies ebook presents a step by step approach to enable your students to better process and retain spoken and written information. What does working memory difficulty look like? Students with working memory difficulties display distractibility, short attention span and have trouble understanding instructions and linking ideas and themes. Working memory is a form of short term memory. It is the information that you hold in your mind just long enough to manipulate or 'work' to make any new information meaningful. For instance, if I were to say to you repeat these three animals: mouse, horse, rabbit, you would have little trouble recalling the animals. However, if I then asked you to repeat the animals from smallest to largest then you are compelled to use your working memory skills. The mental arrangment and sequence of the three animals from smallest to largest is a more taxing and difficult task. To successfully repeat the animals in order from smallest to largest, requires you to manipulate the information. You may visualize the relative sizes of a mouse, rabbit and horse and arrange them mouse - rabbit - horse. Students with working memory problems don't 'work' new or complex information very well. In fact, we know that children with working memory problems have trouble integrating, manipulating and learning new information. They fail to process or successfully 'work' information that is too complex or too wordy. Why is Working Memory more Important than IQ? Classroom discourse places a heavy burden on working memory. The difficulty begins with teacher instructions that are too complex for students to process, which impacts on their ability to independently carry out tasks. Working memory difficulties jar and jolt all aspects of the curriculum, from learning new words and concepts to spoken and written comprehension. Once a student fails to process new or complex information they have little opportunity to learn it well. So even if a student has a high IQ and good language skills, he/she may still struggle to learn new information because of weak working memory. I've created the Working Memory Classroom Strategies ebook to assist teachers and parents to better understand how to maximize their students' capability to learn new and complex information. Your students' ability to learn new information can be greatly enhanced by adopting key strategies that ease the burden on their working memory. 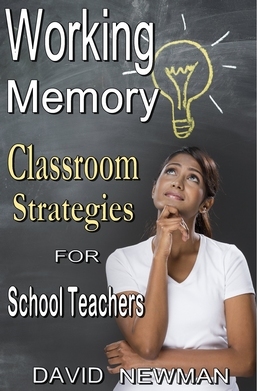 Also included is a bonus ebook that features working memory exercises. The Working Memory Strategies ebook and Working Memory Exercises both feature a 60 day money back guarantee if you're not completely satisfied with either product. You're fully protected and have peace of mind with any transactions. All transactions from this website are processed by E-JUNKIE. Both E-JUNKIE and PayPal are protected by the best ssl certificate technology. This means your credit card or debit card details are 100% safe. When you click through to the order page, look for the green in the address bar at the top of the page, and the little padlock. The green in the address bar is the symbol for high quality security. What happens after I click on the Buy Now button? Well, the process is pretty much hassle free. After you click on the buy now button you will be directed to a secure order form where you will be presented with the option of paying with either paypal or credit/debit card. Once the transaction is complete look for a small, orange oblong box that says 'Complete your purchase.' Click on that box and it will take you to the download page. E-JUNKIE will also send you a confirmation email with download information, so you're covered both ways. It's unlikely you'll have any problems, but if you do please don't hesitate to contact me. and I'll give you a hand.